We are a full-service animal hospital treating dogs, cats, exotics, and small mammals. We pride ourselves the care we provide our the pets and families of the Belton, MO area. 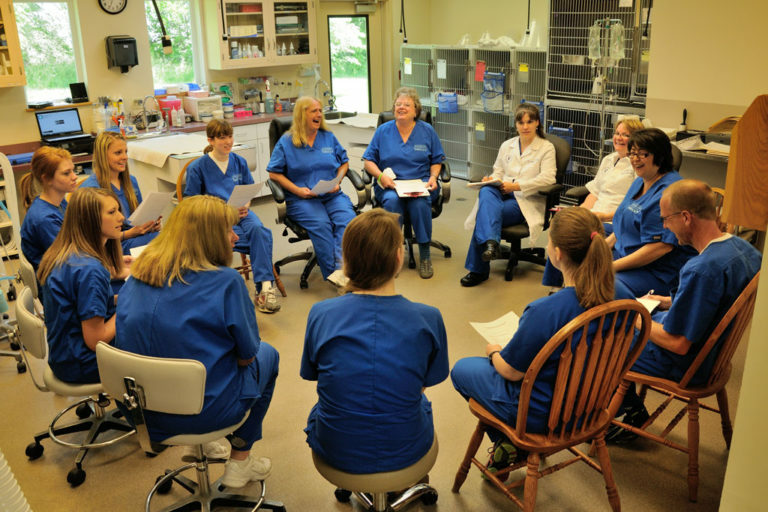 Led by Dr. Teresa Bradley Bays, our staff has over 65 years caring for dogs, cats, and exotics! That’s 455 years in dog years, but who’s counting? Offering everything from wellness exams to general and advanced surgery to acupuncture, our goal is to provide quality veterinary care while taking the time to educate clients on the benefits of our services and treatments. Our facility has a history of complex and interesting surgical cases and our doctors are focused on mentoring and collaboration. Additionally, we offer cold laser therapy and many traditional Chinese holistic treatments, including acupuncture, Tui na, and herbal therapy. In addition to diagnostic and preventative services, our hospital is equipped with digital radiography, digital dental radiography, in-house labs, CO2 laser, cold therapy laser, and ultrasound. Our hospital also offers acupuncture, exotic animal care, veterinary medical manipulation (animal chiropractic), and we are proud to be Feline Friendly and Fear Free certified. We’re focused on making sure our hospital has the right tools to allow our doctor and medical staff the ability to provide excellent service and care. What animal best describes our hospital? A lion — the leader of all innovative and up-to-date treatments; always on the hunt to better our clinic and its service to clients and their pets. We’re experts on a variety of holistic therapies, producing excellent results with respect to pain management and rehabilitation in animals. These include: herbal therapy, acupuncture, cold laser therapy, tui na, alpha stim, and veterinary medical manipulation (animal chiropractic). With a location only a short drive from Kansas City, Belton, Missouri offers a perfect mix of residential beauty and bustling commerce. You’ll find plenty of opportunity to enjoy a horseback ride, go back in history with a visit to the Belton Grandview & Kansas City Railroad, or take in a Royals or Chiefs game. As veterinarians, technicians, and practice staff, our goal is to treat every family and pet that walks through our doors as one of our own. We provide the highest standard of care. And we do this really well. A partnership with Veterinary Practice Partners means each hospital has the support of a team of finance, human resources, operations and marketing experts. We encourage professional growth through a continuing education allowance, in-house training programs, and online education. We structure our benefit packages to support you. This includes generous PTO, health benefits, 401(k) with match and more! Your pets are family too! We offer generous discounts at our hospitals for the care of employees’ pets. Good people know good people! Use your network to refer a colleague to a DVM position at one of our hospitals and we’ll pay you $2500 after their first 60 days of work. Don't see a good fit... yet? We're growing and constantly adding new positions. Let us know what you'd be interested in and we'll alert you of future opportunities.